The interdisciplinary symposium “The Craft of Experience Design” brings together makers to share ideas and methods for engaging the audience in performance art, theatre, exhibition design, media art, game design and larp. “Connect the Dots” is a program revolving around participatory artworks, through which we invite the audience to take part in playful and open-ended experiences. The ticket price for the symposium also includes access to the evening program No Patent Pending #29. Missed it? Here you can find the video documentation! After graduating from Theatre Studies at the University of Amsterdam, she studied Scenography at Goldsmith’s Academy London and Choreography at the Laban Centre in London. As a scenographer and video maker she worked with a number of (inter)national directors and theatre groups. At DasArts, (Amsterdam School of the Arts), she specialised herself, assembling theoretical and hands-on knowledge on the relationship between technology and performance. Since then she works as a freelance concept developer for institutions like Waag Society and as an autonomous artist and director of interactive, audiovisual and performative installations. Marloeke is currently affiliated as a tutor with the HKU University of the Arts Utrecht (Interactive Performance Design) and as a researcher with HKU Research Centre Performative Processes. Carina Westling has been researching the practice of the Punchdrunk Theatre Company in depth and just finished her PhD at the University of Sussex titled: “The making of postdigital experiential space: Punchdrunk Company 2011-2014”. She spent time with the company while the projects were designed, built and performed, and has conducted interviews with both the makers and audience members who participated in their shows. Based on these she has made observations on the consequences for the design of audience participation within interactive systems across physical, digital and blended media. She is also the creative director of the Nimbus Group, creating experience design across digital and physical media. Recent projects include Giddy and the Nimbus. Valentijn Byvanck is director of Marres, House for Contemporary Culture, Maastricht, the Netherlands. In Marres, he runs a program in which he explores the senses in a wide array of artistic practices and develops exhibitions including The Winter Anti Depression Show (2013), Levi van Veluw: The Relativity of Matter (2015), Ferran Adria: Notes on Creativity (2016) and The Painted Bird: Dreams and Nightmares of Europe (2017). Byvanck worked before as head of communications and theory at Witte de With (1999-2002), and was subsequently director of the Zeeuws Museum (2002-2008) and the Museum of National History (2009-2011). He has written extensively and made television programs on a wide variety of topics in contemporary art and design. Byvanck holds a PhD in cultural history from New York University. Johanna Koljonen (founding partner, Odyssé Participation Design Agency) is a writer, broadcaster and participation designer consulting on experience design with museums, the public sector and media companies. She is an authority on designing for safety and trust in participation, and lectures on analog experience design, Nordic Larp and changes in the media landscape. She co-founded the Alibis for Interaction Master Class and the Nordic Larp Talks, both of which she hosts, and is the editor of the Nostradamus Project, which charts and predicts the close future of the screen industries. In 2011, she received the Swedish Grand Journalism Award in the Innovator of the Year category. This year she was awarded the Golden Dragon, a lifetime achievement award of RopeCon, the largest non-commercial role-playing convention in Europe. Time’s Up – Laboratory for the construction of experimental situations Founded in 1996, Time’s Up has its principal locus in the Linz harbour of Austria. Its mission is to investigate the ways in which people interact with and explore their physical surroundings as a complete context, discovering, learning and communicating as they do. 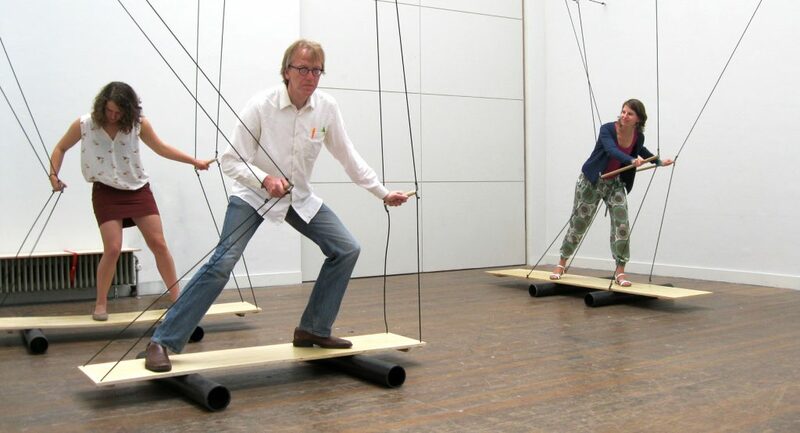 Thus their research is based upon constructing interactive situations not unlike the normal physical world, inviting an audience into them and encouraging their playful experience-driven exploration of the space and its behaviours, alone and in groups. In this research process they use tools from the arts and design, mathematics, science and technology as well as sociology and cultural studies. Their goals are to collaboratively investigate the world and its options with a general public, communicating and discussing these discoveries through workshops, publications, teaching and symposia. Marinka Copier is director of the Expertise Centre for Creative Technologies at the University of the Arts Utrecht (HKU). She holds a PhD in game studies and is co-founder of the international DiGRA (Digital Games Research Association). Her area of expertise is role-play, interactive narrative and play design. Marinka is also the co-founder Society of Play.org and designer of real life games.